First you need to complete several prerequisite steps on your on-premises domain. These are the minimum ports that are needed to connect the VPC to the on-premises directory. Your specific configuration may require additional ports be open. User accounts in both directories must have Kerberos preauthentication enabled. This is the default, but let's check the properties of any random user to make sure nothing has changed. On your on-premises domain controller, open Server Manager. On the Tools menu, choose Active Directory Users and Computers. Choose the Users folder and open the context (right-click) menu. Select any random user account listed in the right pane. Choose Properties. Choose the Account tab. 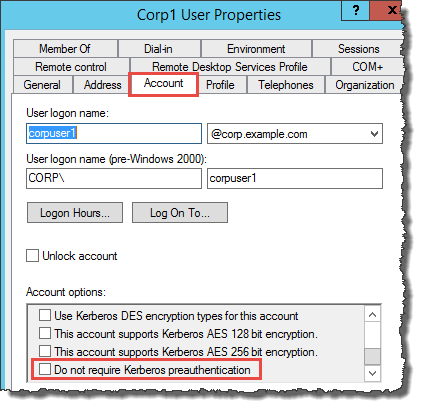 In the Account options list, scroll down and ensure that Do not require Kerberos preauthentication is not checked. 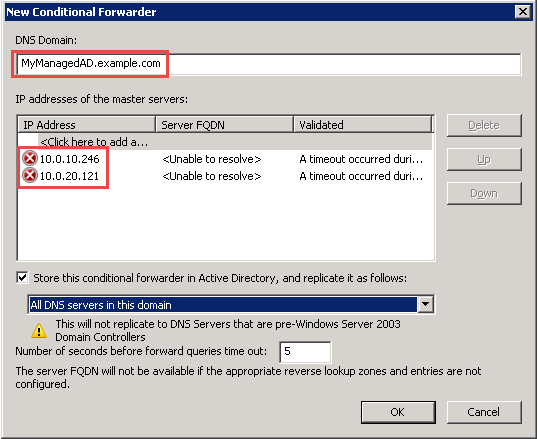 You must set up DNS conditional forwarders on each domain. Before doing this on your on-premises domain, you will first get some information about your AWS Managed Microsoft AD. Sign into the AWS Management Console and open the AWS Directory Service console at https://console.aws.amazon.com/directoryservicev2/. In the navigation pane, select Directories. Choose the directory ID of your AWS Managed Microsoft AD. On the Details page, take note of the values in Directory name and the DNS address of your directory. Now, return to your on-premises domain controller. Open Server Manager. On the Tools menu, choose DNS. In the console tree, expand the DNS server of the domain for which you are setting up the trust. Our server is WIN-5V70CN7VJ0.corp.example.com. In the console tree, choose Conditional Forwarders. On the Action menu, choose New conditional forwarder. In DNS domain, type the fully qualified domain name (FQDN) of your AWS Managed Microsoft AD, which you noted earlier. In this example, the FQDN is MyManagedAD.example.com. After entering the DNS addresses, you might get a "timeout" or "unable to resolve" error. You can generally ignore these errors. Select Store this conditional forwarder in Active Directory, and replicate it as follows. Select All DNS servers in this domain, and then choose OK.